Joseph Sandy’s incredible Hybrid House design was recently honored as one of the winners of the $300 House competition, a contest launched by both the Harvard Business Review blog and Ingersoll Rand Center for Energy Efficiency and Sustainability. Faced with the challenge to produce plans for a “simple dwelling”, Sandy developed an amazing idea that integrates recycled, low-cost materials into a simple, dignified and efficient home. 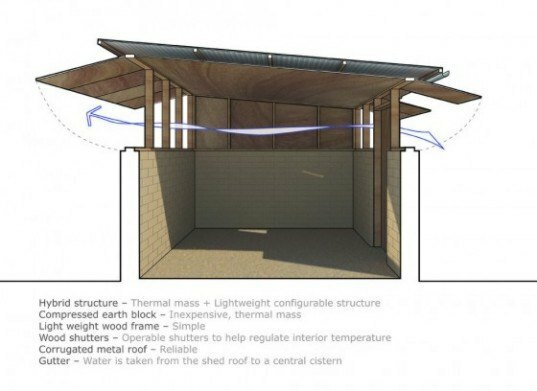 Utilizing basic materials commonly found in slum housing – ply wood planks, earth, and corrugated iron – the hybrid house would be formed using compressed earth blocks around a lightweight wooden frame. Complete with operable wood shutters, the house would make the most of natural cross breezes, minimizing the need for air conditioning. 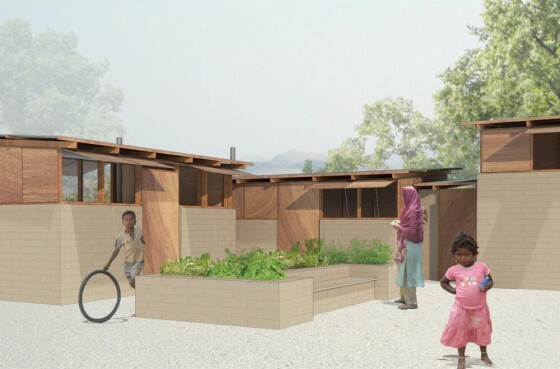 Sandy’s design demonstrates how materials seen in slum housing could be converted to make them more efficient and better formed by simply recycling materials and redefining their purpose. He states within his design that the cost of this basic strategy would be under $100 — a fantastic achievement for such a small budget. But his ideas don’t stop there, with ambitions to reaching towards a greater community, Sandy suggests that individual houses could be clustered around central courts, each one containing communal facilities such as a solar panel, solar cooker, and a solar water purifier that drains to a communal planter in the center. We can’t wait to see this innovative idea become a reality. Solar is the only thing I see that is good for the community especially in India, Africa ..., if the people would go back to the traditional way of building huts like Laurie Baker the British architect realised when he started doing research in India after Gandhi asked him to help the poor. So the traditional buildings and with the age old vasthu of cross ventilation is incorporated, it will be even less than $100. Maintenance is kind of high but it is more suitable for the weather conditions. Sandy is not introducing anything new, except for the Solar part, all these ideas have been in existence since a long time and with the British and the West, India and I am sure Africa too lost touch with their traditional methods. It is very good experiment, our planet need of us, in impruving our mthods of construcction, because if you can use les materials, like dert, and reclabable materials, that is great...the reasonable way woud be to harden more the dirt. That is a neat housing design. Simple, effective. Good show! Faced with the challenge to produce plans for a “simple dwelling”, Sandy evolved an amazing idea of recycling low cost materials to form a simple, dignified and efficient home. Complete with operable wood shutters the house would make the most of natural cross breezes in order to minimize the need for air conditioning. Sandy suggests that individual houses could be clustered around central courts, each one containing communal facilities such as a solar panel, solar cooker, and a solar water purifier which drains to a communal planter in the center.